Sometimes a film gathers so much hype and praise that it simply doesn't reach expectations. This is most definitely not the case with 'La La Land'. Mia (Emma Stone) is an aspiring actress who crosses paths with Sebastian (Ryan Gosling), a struggling pianist who wants to open his own Jazz club. Living in Los Angeles, the two grow close together and have to make a choice between focussing on their love life or their biggest dreams. We're only 4 films into the year but we may have the best film of the year decided already. Damien Chazelle brings yet another great movie based around music after his success with 2014's 'Whiplash' but he goes one step further this time by creating a full-scale musical. From the opening credits, Chazelle makes you feel as if you are watching a classic musical with the opening featuring how the film will be presented on screen. Although the film is set in the present day, you have that feeling of watching a classic. However, that is the case, just that it is a modern classic. You know the saying 'they don't make films like this anymore'?. 'La La Land' proves that this is not the case as it stands up there with the best of the best. The film starts off with a beautiful one shot lasting over 5 minutes as the song 'Another Day Of Sun' plays out on a bridge with all those stuck in traffic participating. This was a very fun scene which also showcased Chazelle' skills as a very talented director. This opening scene was just a taster of what was to come throughout the rest of the film. To start off, 'La La Land' is a musical, a comedy and a drama all at the same time. Usually, when a film comes out that handles different genres, usually one overshadows the others. 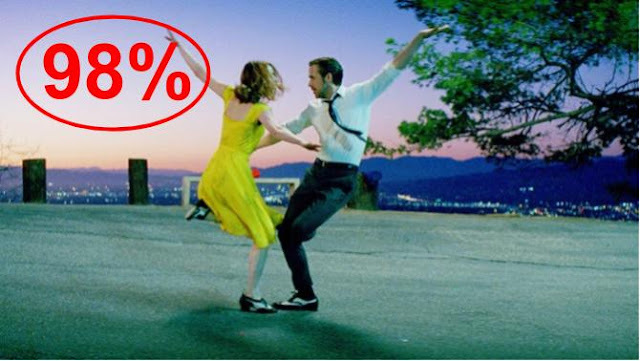 Not the case for 'La La Land' as all three play equally strong parts in this marvellous film. It is no surprise to me that 'La La Land' picked up awards for Best Original Score and Best Original Song (City Of Stars) at the Golden Globes and it would be a safe bet to back them for the Oscars too. The film is filled to the brim with great songs with composer Justin Hurwitz doing a great job creating catchy tunes and setting the mood perfectly. This is one of these films that you are going to be humming for weeks to come, especially the likes of 'Another Day Of Sun' and 'City Of Stars'. Ryan Gosling and Emma Stone both lend their talents to the music in this film making it seem like there is nothing that these two can't do. This is backed up further once you see the pair dancing, with many different styles on showcase within the film. The musical side of this film really is perfect as the music, performances and choreography all come together to create some truly magical scenes. Chazelle is also able to work well with the backdrop of Hollywood in these scenes making the film look superb in the meantime. 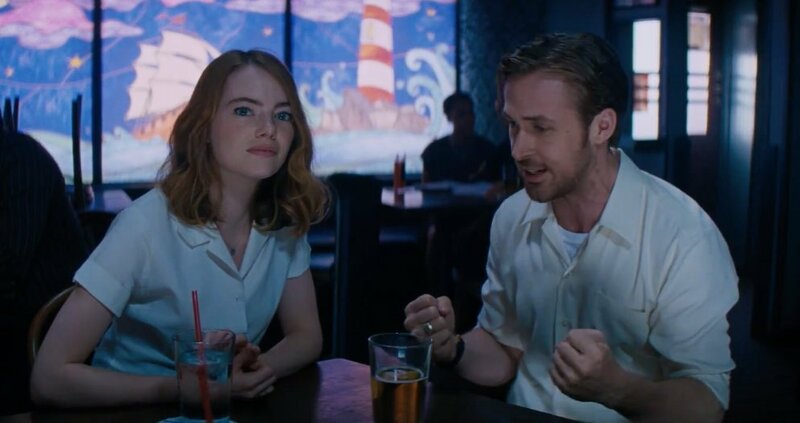 'La La Land' also took home the award for Best Motion Picture - Musical or Comedy, with Ryan Gosling winning Best Actor in a Musical or Comedy and Emma Stone doing likewise in the Actress category. The pair's chemistry works tremendously well in this film, especially in the comedy moments. The two play off of each other's reactions very well early on in the film as they are fairly cynical to one another as they first meet. This leads to one of the best scenes of the year as the pair looks for Stone's character Mia's car, where the two show their talents in comedy. As the film goes on, there are more jokes that are very cleverly crafted, more so than most comedies nowadays. Stone first burst onto the scene in comedies like 'Superbad', 'Zombieland' and 'Easy A' and that experience in the genre is evident here. Gosling as well shows his talents coming off of the criminally underseen 'The Nice Guys', where he continues to show that he is one of the best talents Hollywood has right now. The comedy combined with the upbeat music makes you have a constant smile on your face as you just want to see more of these characters interacting with one another as it is glorious. As effective as the music and comedy aspects are within the film, 'La La Land' also delivers on the dramatic level. The story basically follows two young dreamers, Sebastian who wants to open a bar to play real Jazz and Mia who wants to become an actress. The film highlights the struggles of people following their dreams and shows that it's not an easy journey. More so on Mia's side, we see the characters doubt their dreams, even to the extent of possibly giving up on them. Sebastian also goes through tough moments as he lets his dreams slip by doing something that he doesn't particularly want to that also visibly changes his characteristics. This leads to the film showing the pair having to make a decision between going all out for their dreams or the love and companionship of each other for life. This is very complicated for the duo but that's life, especially in those industries. This brings the fun down a level as it gets serious with Stone and Gosling excelling, showing tremendous range in this film. The finale of this film is extremely well done, I won't spoil it for you but it is emotional and a great ending to a truly great film. It is hard to believe that director Damien Chazelle is only 31 as he handles film like a veteran. Chazelle creates a truly beautiful film, setting up many shots that are breathtaking. Whether it's on the streets of California, movie sets or anywhere, the movie looks fantastic at all times. The camerawork and long takes are a pleasure to watch as Chazelle pulls them off to great effect. Again, his win at the Golden Globes was very much deserved. The film's beauty is also backed up by the beautiful set and costume designs in this film. The characters are sharply dresses which also brings back a classic feeling to the film as from start to finish, the film is gorgeous. It's not very often that a film like this comes along. A film that is as equally exciting and entertaining as it is artistic. 'La La Land' is a modern classic and a film that we will look back on in awe. A truly special film that deserves every single bit of attention that it is getting. Expect to hear a lot about this film at the Oscars after it just broke the record for a number of wins at the Golden Globes. 'La La Land' is a must see. So have you seen 'La La Land'? If so, what did you think of the film? I hope that this review was useful for if you were planning on seeing this film which I cannot recommend highly enough. Once again, thank you for taking the time to read my review, it is much appreciated!